A pair of Northwestern runners take off at the starting line. The Wildcats’ new coach believes the team is well prepared for the outdoor season. With only three indoor meets under its belt this winter, Northwestern is already looking ahead to the outdoor season. “We took it as a deemphasized indoor (season) learning rhythm, learning pace and setting ourselves up for the longer events, like the steeplechase, 5K and 10K,” coach ‘A Havahla Haynes said. Last year was the Wildcats’ first with NCAA sponsorship for the track season, allowing them greater freedom to travel for meets, as well as the opportunity to compete at NCAA Championship meets during both indoor and outdoor seasons. 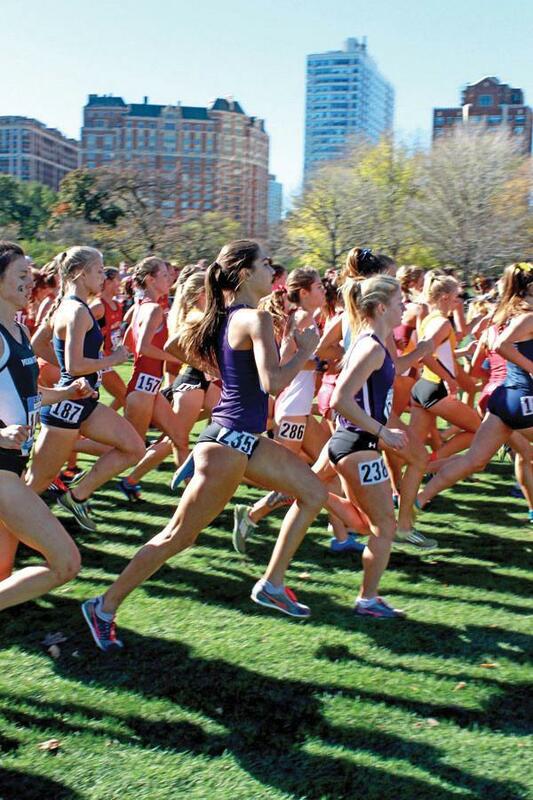 The travel opportunities allowed NU to run in more prestigious meets and compete against some of the top athletes in the nation. As they raced against stronger competition last spring, the Cats smashed old personal best times and junior Andrea Ostenso qualify for the NCAA West preliminary meet. “Our goal (this season) is to get some women qualified for the NCAA’s first round,” Haynes said, referring to the West preliminary meet that serves as a final qualifier for the NCAA Outdoor Championships. Ostenso missed the fall cross country season due to injury, but has returned with a vengeance during the indoor season. At the Windy City Rumble hosted by the University of Chicago on Feb. 6, Ostenso finished second in the 1-mile run with a time of 5:09.35, and set a personal best for 800 meters –– a shorter distance than she typically runs –– in 2:28.85. The Cats saw 10 personal records fall that day, including five in the 800 meters. While most of the team competed at UChicago’s Henry Crown Field House, senior Elena Barham ran at Notre Dame’s prestigious Meyo Invitational. Barham set a 17-second personal best in the 3K against a field that included a handful of professional runners and saw Notre Dame’s Molly Seidel break the school record previously held by Olympian Molly Huddle. Barham’s time of 9:52 was only good enough for 34th against the field at the Meyo Invitational, but is still the Cats’ fastest time this season by more than 30 seconds. This season is NU’s first with Haynes as coach, as she was hired after longtime coach April Likhite retired after last track season. The Cats have one more weekend of indoor competition left, and will send squads to the Orange and Blue Invitational at Illinois and the Alex Wilson Invitational at Notre Dame, both Feb. 20. After Spring Break, NU will begin its outdoor competition at the San Francisco State Distance Carnival on April 2, and will return to the Bay Area a month later for the Payton Jordan Invitational at Stanford.